In this article, we will explain the solution to an interesting problem of WooCommerce product mutual dependency to calculate shipping cost and how WooCommerce Table Rate Shipping Pro can solve that. 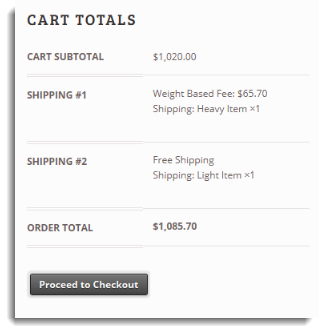 If the user has ordered products only from product category “bulky”, each line item in the cart should be charged a delivery fee. These products cannot be mixed and require multiple deliveries. If the user has ordered products only from product category “small”, only one line item in the cart should be charged a delivery fee. These are small products that are delivered together and should only be charged delivery for one item. If the user has ordered products from product category “small” and “bulky” together, then all products from “bulky” category should be charged a delivery fee and all the products from category “small” should be shipped free. small products can be delivered along with “bulky” products without additional cost. Any guess how can we achieve this without touching the shipping method which calculates the shipping cost per line item? From WooCommerce 2.1 its possible to split the packages into multiple packages and shipping method’s will calculate the shipping cost for each package separately. This also provides a flexibility to enforce shipping method on the particular package. Exactly you can split the packages into two packages. One package with all the products with shipping cost applicable and second package with all the products shipped free. Finally apply a free shipping method to the second package. Heavy item is packaged as Shipping Method#1 and calculated shipping cost. And small item packaged separate and free shipping. How would you make this work with shipping classes instead of product categories? I have shipping class “no-free-shipping” that I need to charge for while the rest of the order ships free. Your business case can be easily resolved using Shipping Class concept.